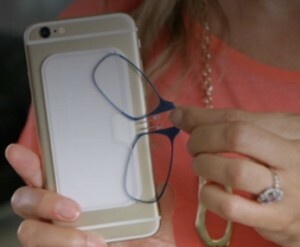 These reading glasses fold at the nose and are so lean you can slip them into a pocket or purse or, better yet, stick the custom case onto the back of your smartphone, the side of your computer monitor, or wherever you do your reading. They come in a different strengths and colors. If you’d prefer a smartphone case with the ThinOptics built-in, click here to see your options.